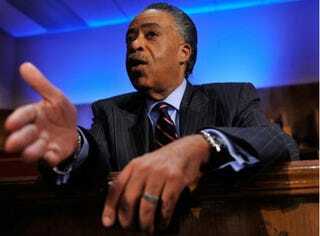 Sharpton to Get His Own MSNBC Show? After a couple of weeks of filling in during MSNBC's 6:00 time slot for regular host Cenk Uygur, the Rev. Al Sharpton is a hit. Shadow and Act reports that the network has been impressed with his performance during his stint as a temporary host, and even more impressed with his ratings. Since he's been on, the show's numbers have been just behind Fox News' and have regularly beaten CNN and Headline News. As a result, sources say that MSNBC is considering giving Sharpton his own permanent show on the network, in the 6 p.m. slot, and moving Uygur into some other capacity on the network. According to Shadow and Act, the network has neither confirmed nor denied the reports. There's definitely never been any question about whether Sharpton loves the camera — but who knew how much it loved him back? In other news: VIDEO: Al Roker Tries Dirty Dancing.